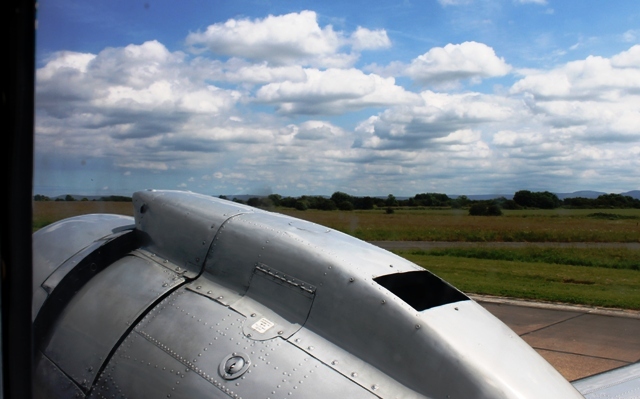 The drone of the engines got louder as we accelerated along the runway, fields and trees flashing past the window as we gracefully lifted up into the clouded, sun-streaked skies above Durham Tees Valley Airport. The clicking of cameras and animated chatter ricocheted though the cabin as the elegant elderly plane forged its way up into the sky. Just a few minutes before we had been drinking champagne and nibbling canapes at a welcoming reception in the airport terminal. 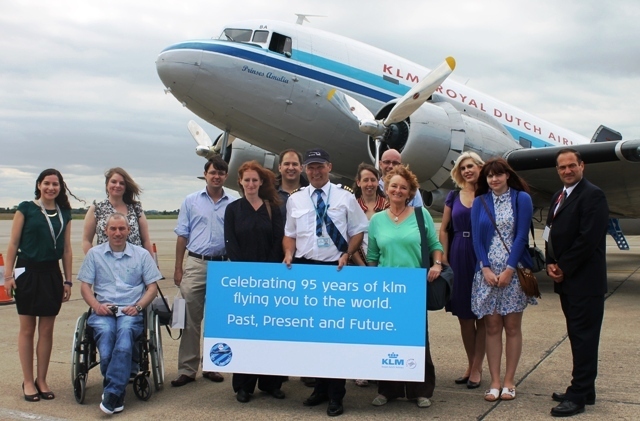 We’d been invited to join a very special flight aboard a vintage Dakota DC-3 to celebrate 95 years of commercial flights by KLM Royal Dutch Airlines. 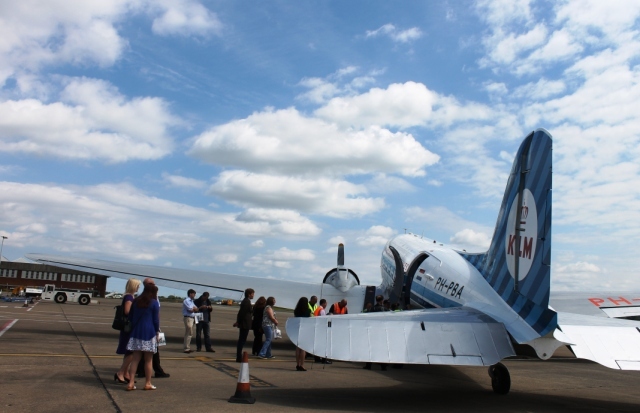 To get us ‘in the mood’ even more, a band played 1940s music whilst we chatted and gradually got more excited about our very special opportunity to fly in one of the few remaining Dakota DC-3 planes in the world. We were called through to the Departure Lounge and out onto the tarmac. 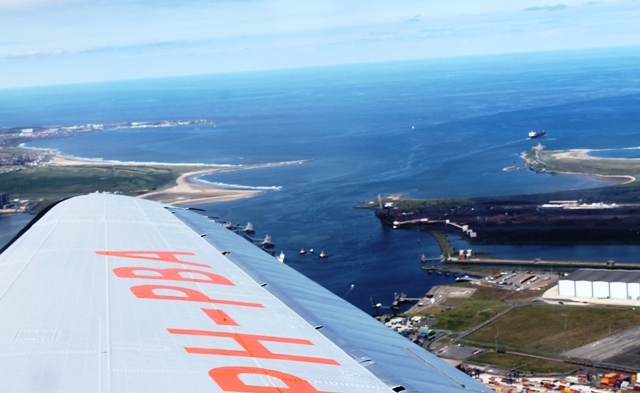 In front of us was the very lovely KLM Dakota DC-3 ‘Prinses Amalia’. The plane is 75 years old and was used during World War Two – the pilot showed us the riveted plate that was put in place during the war. 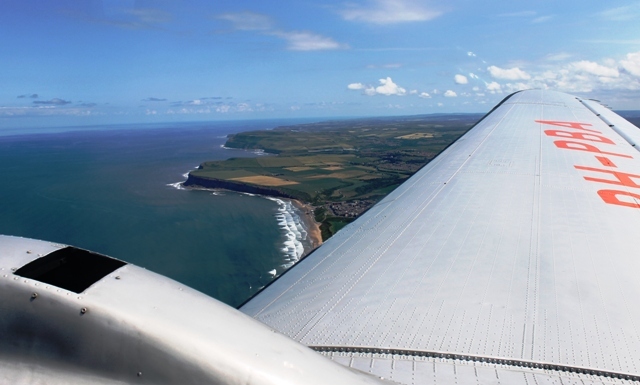 The Dakota DC-3 changed the face of flying forever, being one of the very first luxury passenger planes to make flying accessible to many – it even had berths to accommodate lengthy overnight flights. We took lots of photos and posed for a group shot before boarding. 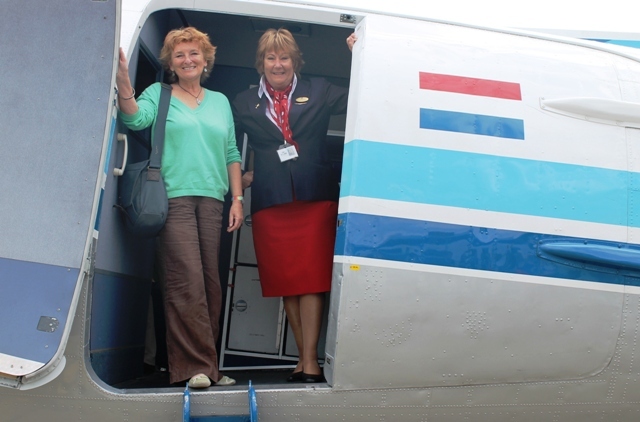 As I climbed up the steep steps of the ‘ladder’ the air hostess (yes PC Brigade, we could call her that) told me that Queen Beatrix of the Netherlands used the plane as did many other Dutch dignitaries and famous folk. Being only 12,000 feet up we got a marvellous view and the captains gave us a running commentary on the sights below. We were allowed to go into the cockpit where old and new technology was being used. 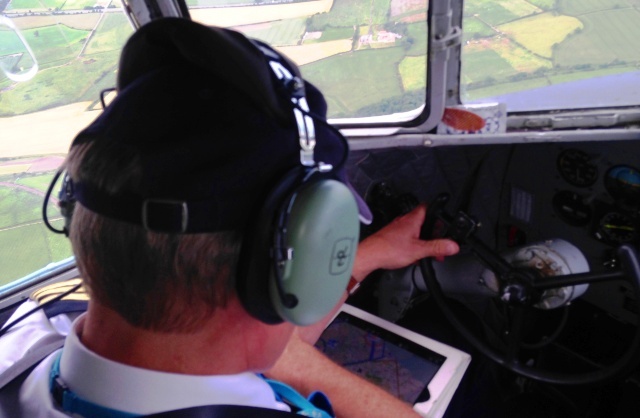 One pilot had an old-fashioned map and the other an iPad. 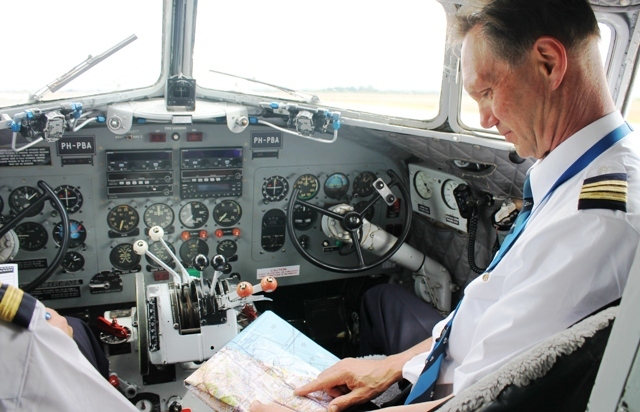 They said it was a privilege to fly the plane and relished ‘real hands-on flying’ with no satellite or computer navigation but plenty of dials, sticks and instruments to play with. We wheeled over the industrial landscape of the River Tees estuary, with a forest of wind turbines dotted around the sea and ships like toy boats heading off to foreign shores. The steady thrumming of the engines, the whirling of the rotar blades and the thousands of rivets glittering along the metallic wing were somehow hypnotic and strangely reassuring. 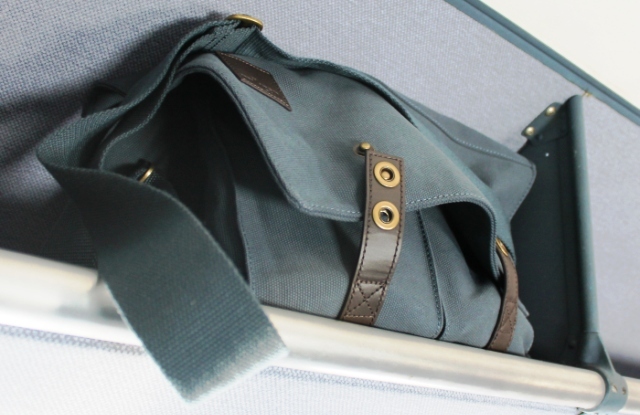 It all felt very different from the modern-day airport travel – and much more enjoyable. All too soon we had turned round and were descending towards the airport. A smooth landing and we were brought to a gentle halt. I was really reluctant to leave this beautiful aeroplane and took great delight in posing at the top of the steps with one of the friendly crew, feeling vaguely like some latter day film star arriving in Monte Carlo. 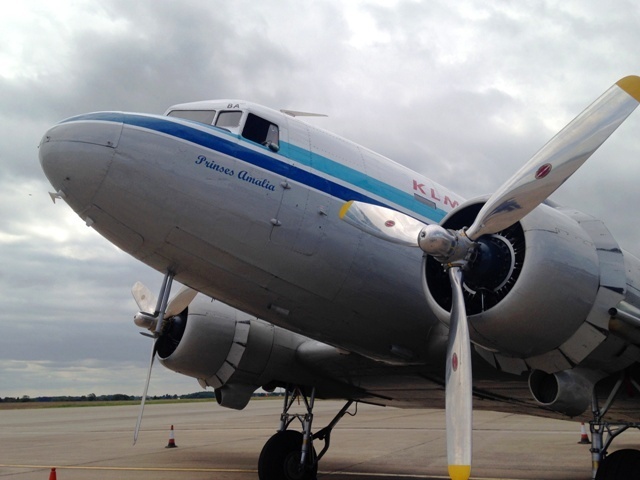 Watch this short video to get an idea of what it’s really like to fly aboard the historic KLM Dakota DC-3 . 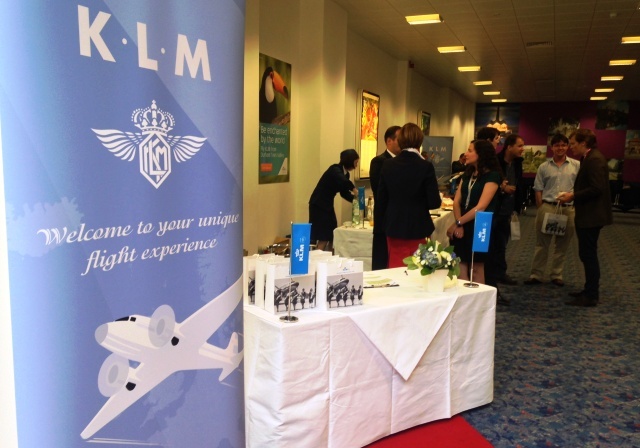 Thanks to everyone at KLM and Durham Tees Valley airport for a splendid day out. It’s most definitely thumbs up for this truly memorable and unique trip! 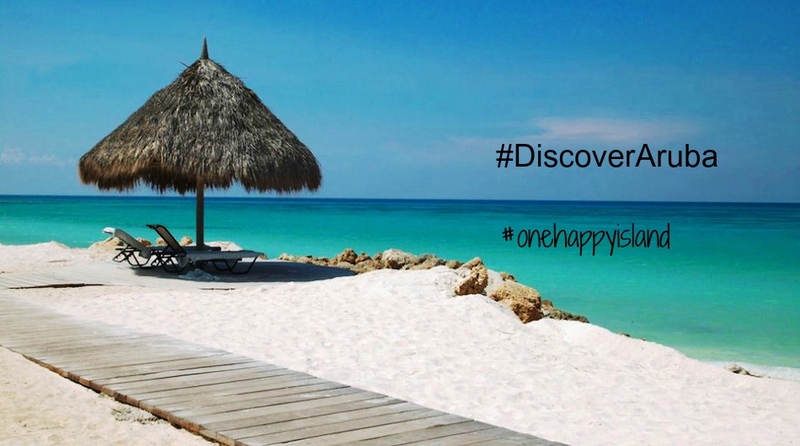 Read: Fun Things to do on Aruba, a Caribbean island with strong Dutch links. 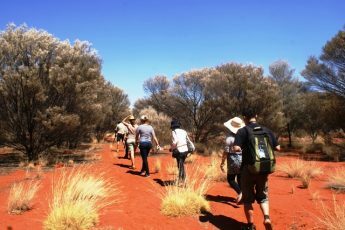 You can fly there with KLM via Schiphol Airport. 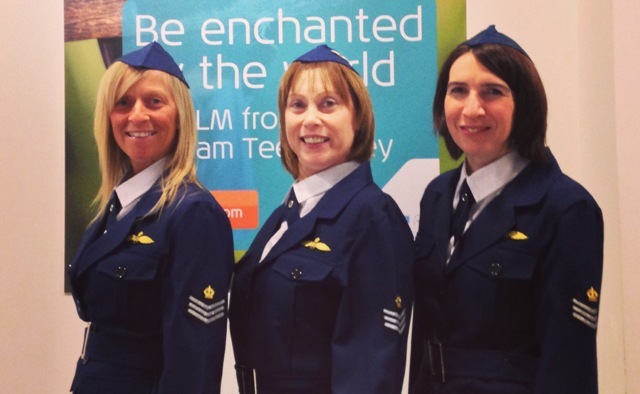 One of the memorable things about a very special flight was that everyone, including the KLM staff and crew REALLY enjoyed it. There is something very attractive about these old ways of travel that appeals to us all. Like going on a steam train, a vintage car or an old ship, this plane seems to have a personality of its own. 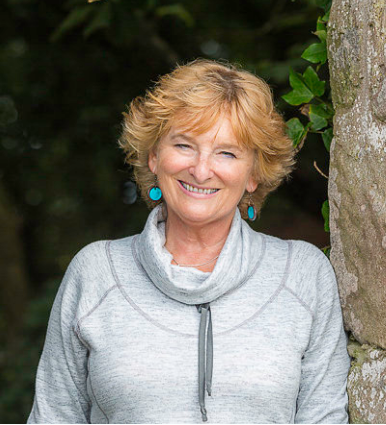 Something that today’s sleek, speedy and highly computerised methods of transport very often lack. we need an DC3 during April 2015 for meeting in Luxembourg !